The three-part English Articles Tutorial gives you usage tips to help you use articles like a native speaker. Here in part 1, we introduce A and AN and teach you how to choose between the two. The article A is used before singular, countable nouns which begin with consonant sounds. 1. He is a driver. 2. She doesn't own a motorbike. 3. I saw a tiger at the zoo. 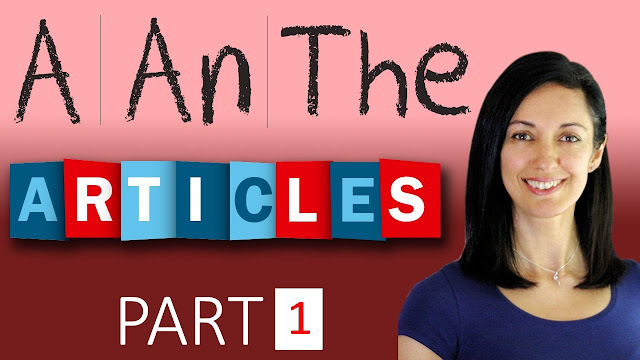 The article AN is used before singular, countable nouns which begin with vowel sounds. 1. He is an actor. 2. She didn't get an invitation. 3. I saw an eagle at the zoo. Remember that A(AN) means "one" or "a single". You cannot use A(AN) with plural nouns. I saw a bears in Yellowstone National Park. Not correct because bear with (s) is plural. If there is an adjective or an adverb-adjective combination before the noun, A(AN) should agree with the first sound in the adjective or the adverb-adjective combination. He is an excellent manager. I saw a really beautiful panda at the zoo. Use A before words such as "European" or "university" which sound like they start with a consonant even if the first letter is a vowel. Also use A before letters and numbers which sound like they begin with a consonant, such as "U", "J", "1" or "9". Remember, it is the sound not the spelling which is important. For example, "1" is spelled O-N-E; however, it is pronounced "won" like it starts with a "W". She has a euro. Sounds like "yu-ro". That number is a "1". Sounds like "won". Use AN before words such as "hour" which sound like they start with a vowel even if the first letter is a consonant. Also use AN before letters and numbers which sound like they begin with a vowel, such as "F" or "8". Remember, it is the sound not the spelling which is important. For example, "F" is pronounced "eff" like it starts with an "E". I only have an hour for breakfast. Sounds like "au-er". Does her name begin with an "F"? Sounds like "eff". Some words such as "herb" or "hospital" are more complicated because they are pronounced differently in different English accents. In most American accents, the "h" in "herb" is silent, so Americans usually say "an herb". In many British accents, the "h" in "herb" is pronounced, so many British say "a herb". In some British accents, the "h" in hospital is silent, so some British will say "an hospital" instead of "a hospital". In English, some nouns are considered uncountable such as: information, air, advice, salt and fun. We do not use A(AN) with these uncountable nouns. A and AN are called indefinite articles. "Indefinite" means "not specific". Use A(AN) when you are talking about a thing in general, NOT a specific thing. Use A(AN) when talking about a thing which is new, unknown, or introduced to a listener for the first time. Also use A(AN) when you are asking about the existence of something. � I have a Bike. The bike is being introduced for the first time. � Dany is a teacher. This is new information to the listener. Similarly, use A(AN) to introduce what type of thing we are talking about. REMEMBER: You cannot use A(AN) with plural nouns because A(AN) means "one" or "a single". THE is called a definite article. "Definite" means "specific". Use THE when talking about something which is already known to the listener or which has been previously mentioned, introduced, or discussed. � I have a dog. The dog is black. � There is a ruler in my backpack. The ruler is very light. � Do you know where I left the motorbike keys? The listener knows which specific motorbike keys you are talking about. � Do you have a car? Is the car blue? You assume they do have a car after asking about it in the first sentence. � Nobody lives on the sun. The sun is known to everyone. IMPORTANT: You can use THE with both singular nouns and plural nouns. Can you give me the pen on the table? We use THE in this sentence because the phrase "on the table" tells the listener which book we are referring to. We are not talking about other books, we are talking about a specific book that the listener can see or already knows about. Learning to recognize such identifying clauses and phrases will help you use THE correctly. � Did you read the novel book which I gave you? � She didn't like the song that you suggested. � He loved the sweat with chocolate and cherries. � The phone on my desk belongs to Dara. � Did you know the woman who was talking to Ronaldo? HOWEVER: Not all clauses and phrases make the noun known to the listener. Some are simply descriptive. They add extra information, but they do not tell the listener which specific thing we are talking about. � He bought the house with a big backyard. This combination tells the listener which specific house he bought. � He bought a house with a big backyard. This combination tells the listener what kind of house he bought, but not the specific house he bought.